- ‘Spring, Summer, Autumn, Winter...and Spring’ (2003, directed by Kim Ki-duk), about a Buddhist monk living in an isolated monastery on a lake, as he passes through the seasons of his life (see cover image). - ‘Joint Security Area’ (2000, directed by Park Chan-wook), about a fatal shooting which takes place at the North-South Korean border and the differing accounts of those who witnessed the murder. - ‘3-iron’ (2004, directed by Kim Ki-duk) is a romantic drama about the relationship between an abused wife and a young wanderer who breaks into her house. - ‘Pieta’ (2012, directed by Kim Ki-duk), about a loan shark who is forced to rethink his violent lifestyle when a woman arrives claiming to be his mother. The film will be shown in Korean with Russian subtitles. 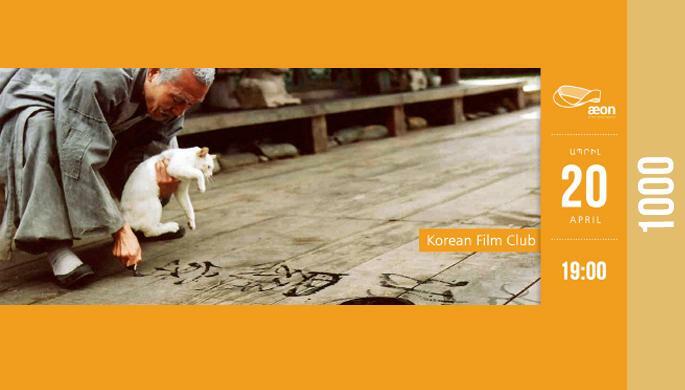 After the film there will be a discussion about Korean cinema, including an introduction to the Korean language. Our host will be Simona, a Birthright volunteer from Russia who has lived in South Korea and visited North Korea on several occasions, and so will give us a unique view of these films. Entrance is 1000 AMD, including coffee, tea and snacks.